This Fennel Seed bread is the first recipe that I converted from commercial yeast to a starter following Clotilde from Chocolate and Zucchini's method found here. It was wildly successful and the bread was a big hit at my spice group's Fennel Seed Potluck. 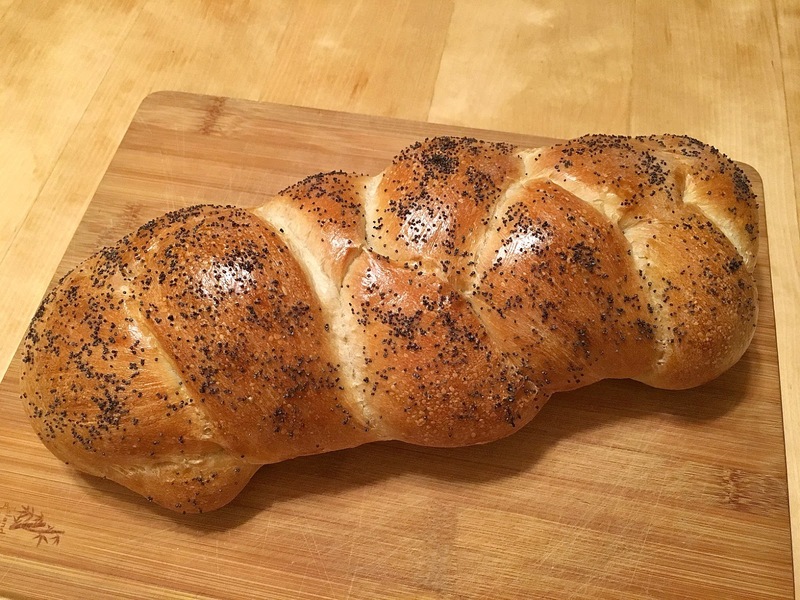 It was also my first ever braided bread. The texture is dense and firm, while still being light enough to form yeast holes, and surprisingly flavorful. The fennel seeds give it an extra oomph that goes well both with butter and with any kind of sandwich filling you want to use. I use it most often for my peanut butter and banana breakfast sandwiches but it makes a great cheese, ham, or tuna salad sandwich as well. It is equally delicious toasted. The outside gets crispy and the inside stays soft and chewy. I will often cut a thick slice to take to work with some hard boiled eggs and make toast in the toaster oven and have that for breakfast. My co-workers are envious when they see me eating that. On weekends I will toast it to eat with an omelet or frittata. It is hands down the best bread that I make, in my opinion. And I make some pretty good breads if I do say so myself. And with few ingredients and minimal fuss it is an easy bread to make. I make it almost every week and it is a simple thing to mix the dough, let it rise for anywhere from one to three hours, form the loaf and let it rise again for anywhere from one to two hours, then throw it into the oven to bake for another hour more. Sometimes I will mix the dough the night before I am going to bake it and throw it in the refrigerator overnight then take it out, let it come to room temperature, shape it and bake it. Or sometimes I will make the dough, let it rise, shape it, and then throw it into the refrigerator to bake the next day. 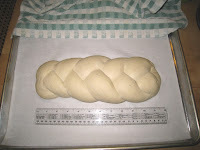 I took this picture of the first loaf that I made with a 12-inch ruler to show the length of the dough before proofing. It looks better than the many braided breads I have made since, I am a little sad to say. The recipe makes a larger than usual loaf. I have kept it that size because it is just that good. But I can only eat a loaf worth's size in week, so I usually cut off a big chunk to give away to a friend or co-worker. 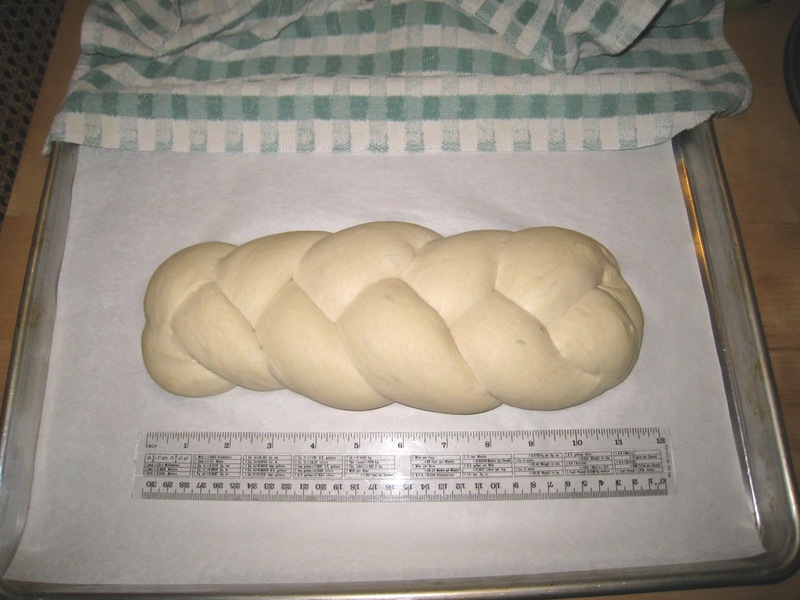 Or I will cut off a piece of the dough before I bake it to make a mini-loaf to give away to someone. It makes me a very popular person around the office. Punch down dough and turn it onto a clean surface, adding flour if necessary. Knead a few minutes to get rid of any bubbles that formed during the rise. Divide the dough into 3 equal pieces and preshape for baguettes. Place the pieces seam side down, cover, and let sit for 20 minutes. Roll each piece into a strip about 10 to 11 inches long (be sure not to make it any longer than your baking sheet). Braid the three strips together. Pinch the ends together and turn them down under the loaf and place it on a baking sheet lined with parchment paper. Cover and let rise for about 45 minutes, or until doubled in size. After 15 minutes, preheat the oven to 350° F.
Combine the egg white with water and whisk together. Brush the egg white over the top of the loaf and put it in the oven. Bake for 45 minutes or until the top is golden brown and sounds hollow when the bottom is tapped. Let the loaf cool completely on a wire rack.